The class of 1943 prepared this approximately 3-1/2" x 2" Sun Catcher for their reunion. 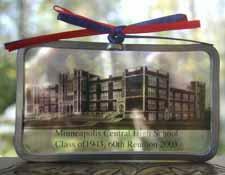 The text as shown here is "Minneapolis Central High School" and " Class of 1943, 60th Reunion 2003." The text is changed as desired for the particular situation. Contact John Leak at (952) 941-3525 for additional information. The class of 1948 prepared this 2' x 10' banner to identify the location of their reunion. The class year shown can be changed. The cost is $15 per use. A $75 deposit is required. Contact Jerry Flugaurat (763) 494-4027 or John Moberg at (612) 866-7121. The class of 1959 prepared this postcard to tell their classmates about reunion plans. The postcard shows the new Minneapolis Central High School in 1913. Contact Hans Sandbo about purchasing the postcards and having them printed with a message and names and addresses from your database.